In her new solo show, writer and performer Jenna Watt begins: 'Almost everybody who is politically conscious has strong feelings about one or more of these issues; but I want you, if you can, to set aside such feelings and consider yourselves only as members of a biological species which has had a remarkable history, and whose disappearance none of us can desire.' Watt quickly acknowledges this as a quote authored by Bertrand Russell and Albert Einstein, shattering the solemnity of her opening gambit with a knowing and warm admission in the spirit in which she means to go on. In this powerful exploration of Britain's continuing maintenance of nuclear weapons through the Trident programme at Faslane, Watt avoids re-opening the wounds of the Cold War in favour of tackling the issue as it stands in the present moment. She pitches her performance well, with her gleeful comic timing providing moments of levity and her emotional honesty punching through with conviction and passion. 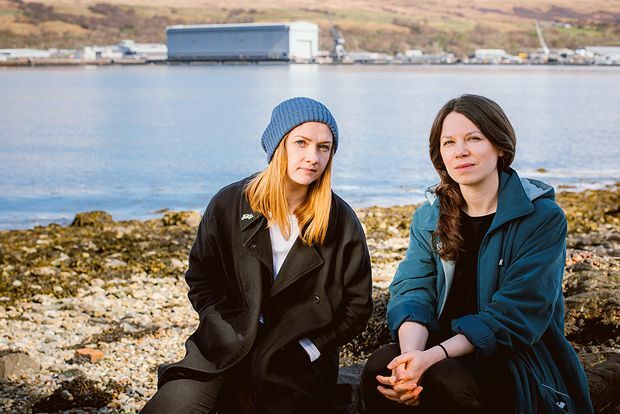 Unsurprisingly, Faslane cannot quite shake the imagery of the apocalyptic, with Kim Moore's electronica-inflected soundscape corralling chants, warlike drums, and clipped political calls to action to ominous effect. By her own admission, Watt is attempting to consider the myriad responses to the potential of thermonuclear devastation that is beyond comprehension in its sheer scale alone. This leads her to focus on the human dimensions of the Trident programme: from the staff at Her Majesty's Naval Base Clyde (the operational base for Trident in the UK), to the residents of the Faslane Peace Camp sited alongside it since 1982, and to all the other spaces she discovers that lie politically somewhere between the two. Watt is candid, confessing a fabrication here, redacting the details of a confidante there, and facing up to her own biases as and when they arise. However, much like the 'crap Easter magic trick' she performs for her family in which she asks them to select one of her hands when in fact both hold the same reward, what is revealed in one hand, is concealed in another. This is not the product of deceit, malice, or trickery, but rather the rich dramaturgical work at play which draws reported encounters and Watt's own artistic voice together under the theme of family in the shadow of the nuclear world. Summerhall, until 28 Aug, 7.15pm, £10 (£8).